Alyson Miles from School Choice Ohio spoke at the Feb. 26 meeting. 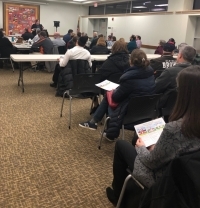 About 60 residents met at the Lee Road Library on Feb. 26 to learn about the EdChoice Scholarships that are becoming more available for students in Cleveland Heights, as state test results for Heights High have fallen to the “underperforming” category. At the request of residents, Americans for Prosperity Foundation invited Alyson Miles, board chair of School Choice Ohio, to explain eligibility and the application process. School Choice Ohio (https://scohio.org/) is an independent not-for-profit that offers to assist parents in navigating the program. The Ohio Department of Education provides information about the program on its website: http://education.ohio.gov/Topics/Other-Resources/Scholarships/. Compared to the per-student cost of CH-UH public school (estimates range from $16,000 to $21,000), the EdChoice scholarships are quite small: $4,650 for K–8, $6,000 for high school. And, there are many restrictions to the program. The private school cannot charge the student more than the scholarship amount, so if high school tuition is $10,000, the student cannot be billed for the difference. I assume private school endowments and donations pick up the difference. If your child is already enrolled at a private school, you are not eligible for the scholarship. The entry point for many students would be their first enrollment into kindergarten or, later, after the student has been enrolled in public school for one year. We all know students (including my own) who have received a great education at our public schools. CH-UH school advocates distributed an impressive brochure that highlights well-thought-out goals and strategies for successful outcomes for students. The school is offering excellent resources, and it will be up to the parents and students to grasp the opportunity. That brochure is evidence that competition along with other pressures has been an incentive for improvement. However, almost half of parents here decide the public schools are not the best fit for their child. For affluent families, they apply to private school, write a check and that’s the end of it. But low- and middle-income families already paying very high local taxes need financial assistance to make that choice a reality. Yet, the school board and union officials begrudge and bemoan families these small scholarships, even while CH-UH is among the best funded districts in Ohio by a standard deviation. They expect to have a monopoly to draw on the taxpayer well of income, even though many families have opted out, or would. I expect that from Ari Klein, who was at the meeting doing his job as the [teachers] union rep., but the school board could take a broader view of our diverse and multicultural community. Robert Shwab chose to live in Cleveland Heights in 2000, after living in New York, Miami, D.C., Philadelphia, Milwaukee and Connecticut.